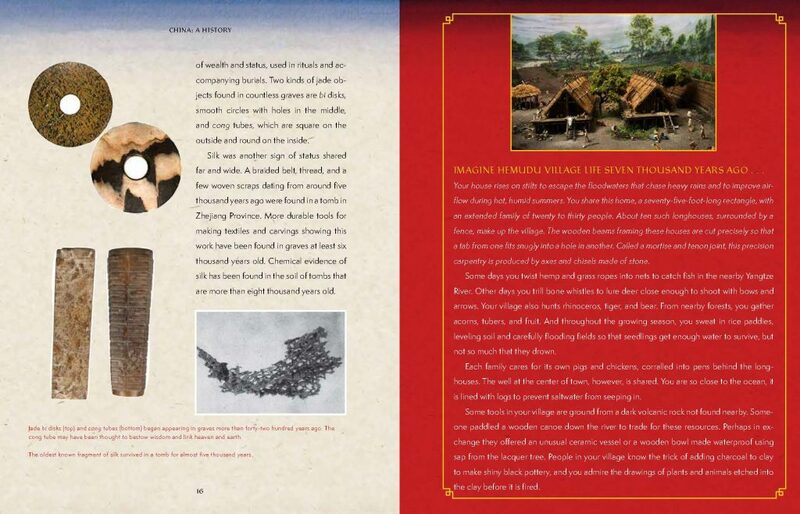 Cheryl Bardoe’s beautiful and educational nonfiction middle-grade book, China: A History, is based on the Cyrus Tang Hall of China exhibit at the Field Museum in Chicago. Whether or not you’ve visited the museum, the book serves as a go-to resource for young readers looking to learn more about this powerful nation. 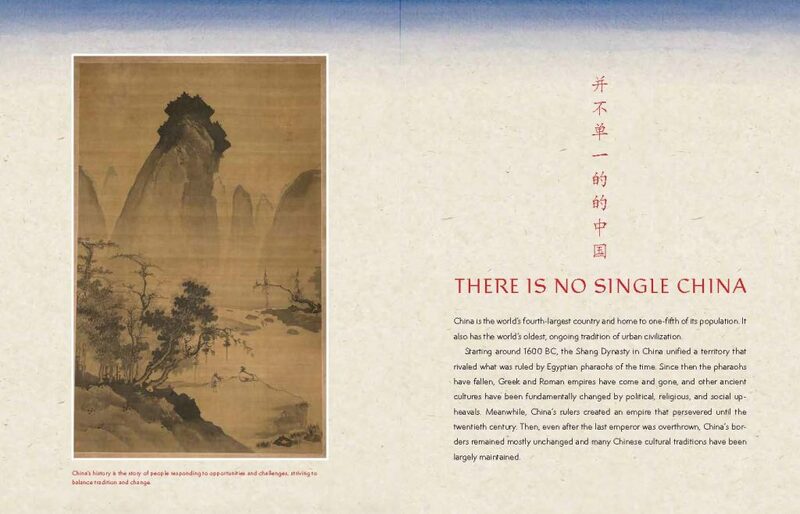 Interior spread from China: A History by Cheryl Bardoe, The Field Museum, Abrams Books for Young Readers ©2019. 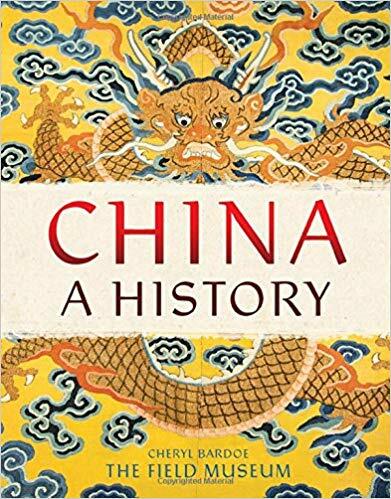 Both a visual feast and a wealth of knowledge, China: A History provides information in a way that’s easily understood, interspersing frequent visual aids. 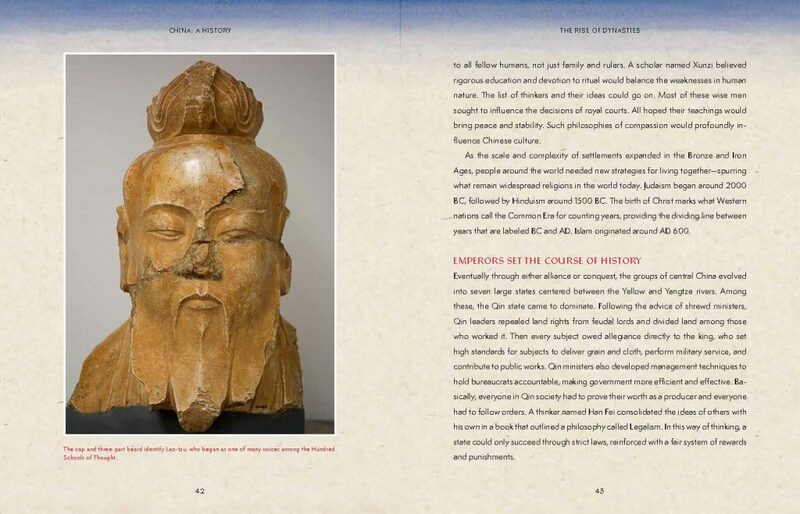 Chapters are enlivened with full-color maps, photos, and illustrations of the people, landscape, artifacts, and rare objects. Kids will be amazed to discover all the remarkable things related to China. Attention-grabbing stories include the 8,000 nearly life-sized terracotta warrior statutes buried with the emperor Shi Huangdi for the afterlife. Your feet may ache when reading about the painful custom of female foot-binding (officially banned in 1911). And, fascinating for everyone who loves eating noodles: “The world’s oldest-known noodles were discovered beneath a bowl that tipped over in northwest China, and then was buried under ten feet of sediment that formed a stay-fresh seal for four thousand years.” Those are some old noodles! In honor of the Year of the Pig, it should be noted that pigs were first domesticated in East Asia in 7,000 BC. All ages will be fascinated by this lovely book. Bold patterns accent pages and bright colors highlight additional material. The text concludes with an interesting 20,000-year Time Line. Written by Lisa Wheeler and illustrated by Lisk Feng, A Hug is for Holding Me highlights how the natural world quietly and profoundly speaks to us about love. Exploring the wilderness, a father and daughter take note of speckled eggs “nestled in a tree” and “eggs hold[ing] hatchlings warm and snug.” In plain language, the little girl also expresses the restorative and nurturing power of cocoons and seashells. It’s as if everything in nature is embraced in an eternal hug, kept safe from harm. And from this fact, she knows she too can feel the same love and protection from the simple act of giving and receiving a hug. I also admire the illustrator’s techniques in further drawing us into the little girl’s perspective. We readers (of all ages) are like children, looking up at the big, wide world. Each page in this 24 page book is a wide-angled, double page spread. The leaves of trees are drawn in big, sweeping shades of blue and green, objects are defined by their general shape and color, and Dad appears towering-almost giant sized. Visual details are absent but not because they’re lacking. While the world is big, creation is hard-wired to nurture and care. On land, in the sea, and in our hearts, we can rest assured of this truth, which is the one detail that really matters. We just need childlike faith to see it. 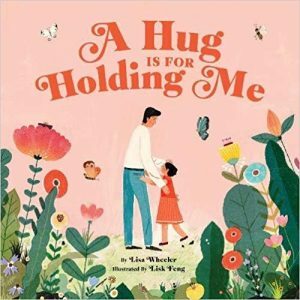 A great read especially for Valentine’s Day, A Hug is for Holding Me is a book preschoolers will love to cuddle up with. 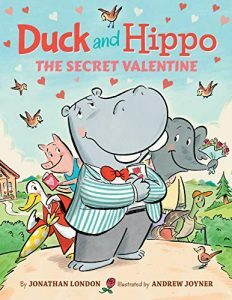 The best Valentine’s Day gifts are the simple pleasures of food, fun, and friendship as author Jonathan London and illustrator Andrew Joyner show in Duck and Hippo: The Secret Valentine. And so the fun begins! Every time a friend receives a card, she or he begins wondering just who that valentine might be. Each hopes for someone specific. Turtle, for example, sees the picture of the “big red heart” on the card as a pizza that’s missing a slice. This makes sense, of course, because his special friend is Pig who works at the local pizzeria, Pig’s Pizza. As the anticipation builds, kids will no doubt love being “in” on the secret, and they will roar with laughter watching Duck stealthily drop off the cards to avoid detection. Well … while the characters may not see Duck, little wandering eyes will most definitely notice a feathery behind sticking out of a bush or two! The onomatopoeia popular in London’s beloved “Froggy” series is thankfully present here as well, helping preschoolers and early elementary children “read” the story. And even if readers are new to the “Duck and Hippo” series, they can sense the strong friendship between the characters and learn important values of sharing and kindness. I also like the hidden “lesson” of time-telling. Whenever the time of day is mentioned in the story, Joyner cleverly includes a clock to indicate the time, with the hour and minute hands in contrasting colors. From illustrating a grandfather clock to an alarm clock to a pocket watch, Joyner invites readers to discover all the fun and different ways of telling time—there’s even a sundial in Turtle’s yard! By 4:00 the secret is finally out, though Duck’s love for her friends is evident from the start. 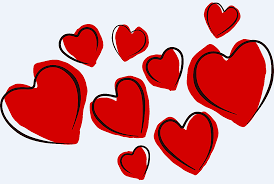 What better way to celebrate Valentine’s Day than to create an opportunity for everyone to gather and express their gratitude for each other. 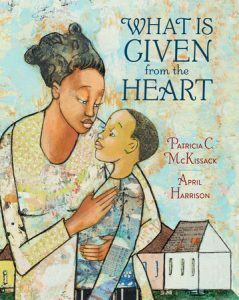 In What is Given from the Heart, celebrated author Patricia McKissack and debut picture book illustrator April Harrison define the true meaning of gift giving. For the first time in a long time, James begins to change perspective. Thinking about another person’s pain makes him aware of what he does have. Tucked “warm and toasty” under Mama’s quilt, James reviews in his mind all the items he owns that might be useful to Sarah. When he sees Mama repurposing the “‘only nice thing’” she has to make a handmade gift for Mrs. Temple, he reflects on how he, too, can sacrifice a beloved belonging to the benefit of someone else’s happiness. McKissack’s themes of compassion, kindness, and empathy are carried through Harrison’s soft color palette and endearing mixed media art. Though the items in the house are sparse, we can see the love abiding in James’ home from the family pictures hung on the walls. My favorite illustration is the close up of James and the pensive expression in his eyes, as he ponders what is in Sarah’s heart and the kinds of things she might like to receive. Despite having very little, James comes up with a beautiful gift that Sarah gratefully accepts. Handmade and straight from the heart, James’ gift helps Sarah know that she is seen and understood. This is a priceless gift every one of us can treasure. A wonderful read for older elementary children, “What is Given from the Heart” reaches the heart not only on Valentine’s Day but everyday of the year. For more Valentine’s Day book suggestions, click here. 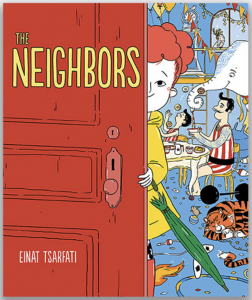 Whether or not children have ever set foot in an apartment building, I’m guessing they’ll want to after reading The Neighbor so they can try their hand at guessing who lives behind closed doors. The narrator of this charming picture book is a little girl who lives “in a building that is seven stories high.” Whenever she heads upstairs and passes by her neighbors’ doors, she imagines, based on clues from each door and its surroundings, just what type of person or persons makes that apartment their home. Interior spread from The Neighbors written and illustrated by Einat Tsarfati, Abrams Books for Young Readers ©2019. Tsarfati’s included a cleverly hidden hamster (note the LOST signs at the book’s beginning) to search for in the comfortably cluttered and colorful illustrations plus one other treat. When her folks check if she’s asleep, the little girl’s eyes look slightly open so she may actually know what her parents get up to. Perhaps it’s a case of the grass is always greener in the other apartments? That it’s open to interpretation is just part of the pleasure derived from reading The Neighbors. I love that the book beautifully incorporates senses such as smell and sound into the story. Parents, caregivers and teachers can take advantage of several possible activities to explore using the book as inspiration. For example, have children create their own doors for you to guess who lives behind them and vice versa. Or maybe cover the illustration after studying the door in the The Neighbors to see what your child can conjure up. This is the kind of book I would have returned to again and again with my children and I hope you’ll agree. Many children’s stories get the parents out of the way by killing them off. 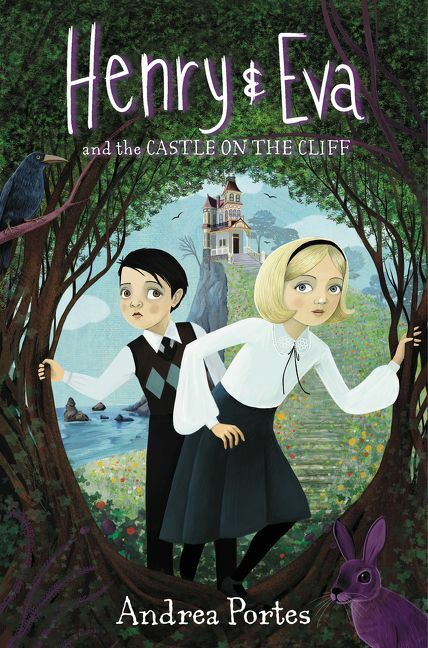 New middle-grade series, Henry & Eva and the Castle on the Cliff begins with the newspaper headline “Prominent Environmentalist and Oceanographer Die in Boating Accident.” However, Andrea Portes’s story surrounds this incident rather than pushing it out of the way and moving on. Siblings, Henry and Eva, suffer from this sudden shock but it’s the first of many in regard to their parents’ death. Details make the story come alive such as Eva’s voice, “[the article in the paper] says that I am twelve and that Henry is ten but it doesn’t say that Henry will be eleven in three weeks and we were already starting to plan his birthday party.” Palpable grief engulfs the kids as they face a new life, one without their folks. Matters are complicated with caregivers, Uncle Claude “the Clod” and his girlfriend Terri “the Terrible,” seeming opposites from Henry and Eva’s parents. 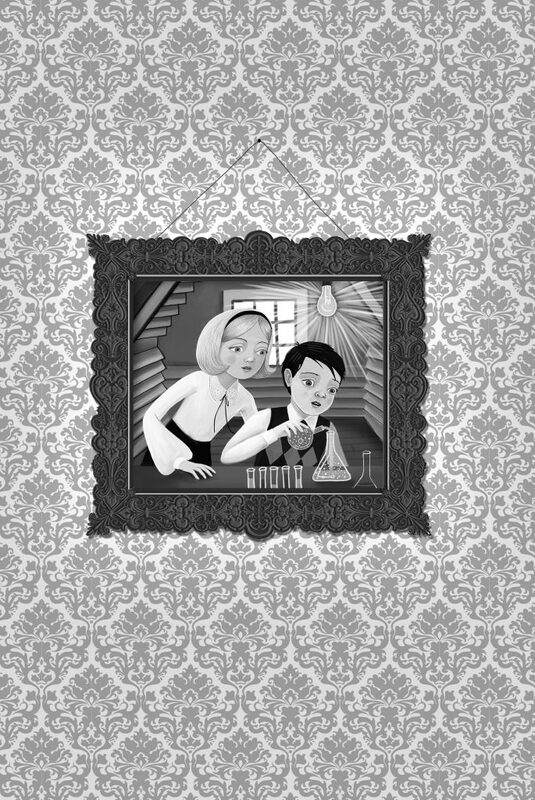 Super-smart Henry has sunken inside himself; Eva tries to cajole him out with silly antics. The kids have a lot to deal with—then the mystery starts! Portes weaves in otherworldly elements in a fresh manner with dimensional and likeable characters. Even the “bad adults” have interesting traits. Levity and humor shine in clever lines of dialogue. Portes is the best-selling author of two critically lauded adult novels: Hick, her debut, which was made into a feature film, and Bury This. She also writes popular YA novels. I’m so happy to have this opportunity, courtesy of MCBD 2019 and Ohio University Press, to share my thoughts about Marlene Targ Brill’s Dolores Huerta Stands Strong: The Woman Who Demanded Justice, an engrossing middle grade biography for young readers. This thoughtful and thoroughly researched book introduces tweens to a Chicana woman who was a force to be reckoned with. While I’d heard of Dolores Huerta, I had no idea of the important and influential role she played in farmworkers’ rights, women’s rights and other causes over the course of many decades. The biography begins with Huerta being awarded the Presidential Medal of Freedom in 2012 by President Obama, quickly pulling us into the account by quoting her mother’s meaningful advice, “When you see people who need help, you should help them. You shouldn’t wait for people to ask.” And Huerta never waited. A Mexican-American, Huerta was born in 1930 during the Depression. Because times were tough, her father Juan, a farmworker, moved the family around based on where he could find employment. But “daily hardships” put a strain on the marriage. He divorced Huerta’s mother, Alicia, when Dolores was around five years old. That’s when Alicia moved the family to Stockton, California where Dolores’s life would be forever changed. With her good head for business, Alicia worked hard and started her own business, eventually buying “a small hotel in Stockton.” It was there that Dolores saw the compassionate and pro-active side of her mother who rented out rooms to low-wage workers for one dollar or for nothing at all. 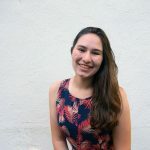 Growing up in a diverse neighborhood, Dolores did not deal with racism and injustice personally until her high school years. Once she saw firsthand the harsh realities of discrimination there was no turning back. Encouraged by her mother to be true to herself, Huerta joined various social activities and had a keen ability to draw people together. This skill would be instrumental in her years as a union organizer as would her chattiness. Throughout her life, Dolores could talk to politicians as easily as she could to laborers. She felt compelled to give a voice to those who weren’t being heard. After earning a teaching certificate, Dolores found a job but at the same time “grew frustrated knowing how difficult it was for her students to learn.” They were poor and “many students came from farmworker families.” These children were undernourished, dressed in rags and were likely living in squalor. Dolores knew she had to do something to help improve the lives of her students and that meant starting with their parents’ plight. She became involved with the Stockton branch of the Community Service Organization (CSO) which ultimately led to her leaving teaching. Despite having two young children, Dolores felt the move was for the best and that, no matter what, the family would manage. Dolores leaped into her new role working tirelessly to register people to vote, eventually coming on board as a full-time activist after meeting fellow CSO activist César Chávez. She lobbied legislators “to enact laws that would benefit poor and immigrant workers” and fought hard for the fair treatment of farm workers. Together with Chávez, Huerta formed an organization called The National Farm Workers Association (NFWA) to secure higher wages and better, healthier working conditions for union members. Perhaps one of the most significant events of the union was to join forces with the Filipino union and strike against grape growers. The Delano Grape Strike was supported by Senator Robert F. Kennedy and led to one major contract being signed for workers but there still was much more work to be done since other growers would not follow suit. 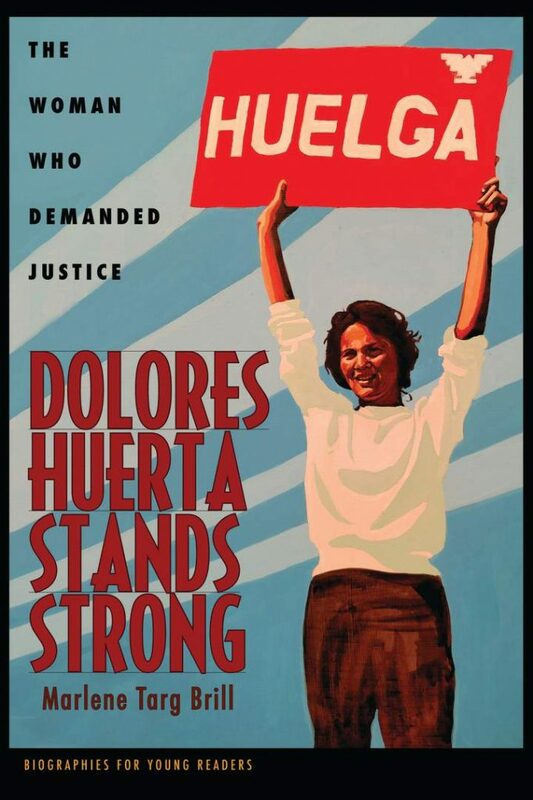 A boycott of table grapes and non-violent protests yielded success for the movement, but for Dolores there were always more battles that needed fighting. Dolores Huerta, as busy as she was, managed to give birth to 11 children and enjoyed a successful third marriage to Richard Chávez, César’s brother. While she suffered several setbacks in her life ranging from getting seriously “beaten to the ground” during a San Francisco march to a sometimes messy personal life, Huerta always looked forward to another cause, be it eliminating pesticides or increasing Hispanic women’s representation, where her activism could make a difference. Her children may not have had the constant presence of their mother as she traveled around the country pursuing justice for farmworkers, children, immigrants and women, but they believed in what she was doing. She taught them that standing up for people’s rights was not only admirable but essential, her lifeblood. Targ Brill’s accessible biography begins with an author’s note and is then divided into nine chapters ending with Did You Know? questions. Also in the back matter is a timeline of Huerta’s life, a glossary, notes and a bibliography. Honest, well-crafted writing along with black and white archival photos bring Dolores’s story to life. There’s no greater compliment than having had a senator from Chicago, Barack Obama, use her unifying slogan, “Sí Se Puede”––”Yes, We Can” for his presidential campaign. As she approaches 89, Huerta’s accomplishments remain a powerful reminder of what one determined woman can accomplish when “No” is not a consideration. We’d like to also give a shout-out to MCBD’s impressive CoHost Team who not only hosts the book review link-up on celebration day, but who also works tirelessly to spread the word of this event. View our Co-Hosts HERE. TWITTER PARTY Sponsored by Make A Way Media: MCBD’s super-popular (and crazy-fun) annual Twitter Party will be held 1/25/19 at 9:00pm E.S.T. TONS of prizes and book bundles will be given away during the party. GO HERE for more details. Twelve-year-old Kestrel’s dark and mysterious world is literally defined by Where the Woods End. And she wants out. Since her mother’s the village witch and her father a lonesome wolf hunter, Kes doesn’t fit in with the other kids. Brushing off their taunting, Kes, instead, utilizes Granmos’s harsh training to destroy grabbers—these beings build bodies resembling their victim’s greatest fear; once they’re complete, your time is up. With her weasel-like sidekick named Pippit and her tree-living friend, Finn, Kes studies Granmos’s notes, trying to discover a way to the world beyond before her grabber attacks. All the while, other fantastic ghouls (like treecreepers and face painters) loom dangerously. Salter’s middle-grade horror fantasy novel’s imaginative world with twists and peril will keep you turning the pages. We feel Kes’s plight for redemption and freedom. She’s an outcast in her town and her home, yet bravely tries to make sense of the mysteries. In doing so, her friendships quiver and threaten to break as she becomes more entrenched in her quest. 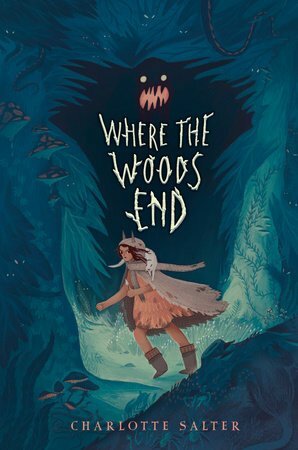 Where the Woods End will appeal to middle-grade readers seeking adventures in creepy worlds. Interior illustrations by Sourcebooks, Inc.
Middle-grade foodie or picky eater? 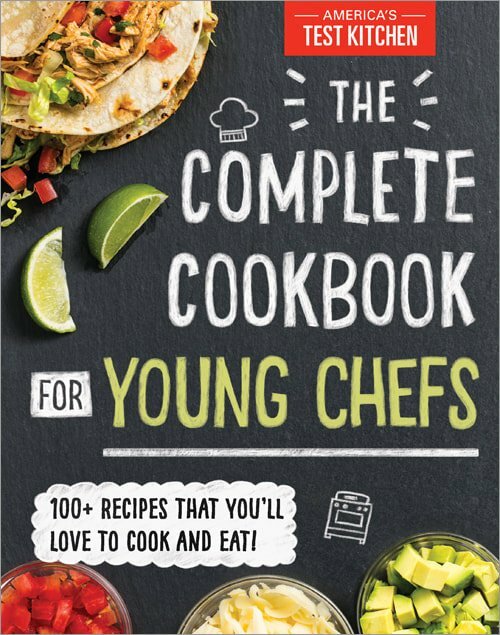 The Complete Cookbook for Young Chefs, a National and Regional Indie Bestseller from America’s Test Kitchen, works for both kinds of kid. Foodies will enjoy testing their know-how; picky eaters get involved in the process, opening doors to new foods. The text guides the inexperienced, starting with the basics: “read carefully, stay focused, practice safety, mistakes are OK.” Tools, kitchen lingo, and how to best do things are explained. Fancy touches such as garnishing and plating make dishes shine. Interior spread from The Complete Cookbook for Young Chefs by America’s Test Kitchen with Interior photography by America’s Test Kitchen and Interior illustrations by Sourcebooks, Inc, Sourcebooks Jabberwocky ©2018. Beautiful color photos accompany the 100+ kid-tested and kid-approved recipes. Each is rated with one to three chef hats to quickly identify the difficulty level (more hats = more complexity). Symbols also note whether the recipe requires a knife, microwave, stovetop, oven, or if no knives or heat are necessary. For example, hummus is a one-hat, no knife/heat recipe, whereas Mexican Street Corn warrants three hats, the use of a knife, microwave, and oven. Using the Tea, No Kettle method, my daughter tried steeping tea bags at room temperature to make tea without bitter notes and that worked really well. I also found the suggestion in Decorating Cupcakes to keep sprinkles within the cookie cutter a clever idea and would recommend this anyone, especially to add a special design touch. The book concludes by explaining the US Department of Agriculture’s MyPlate illustration to help kids recognize the major food groups and portioning. 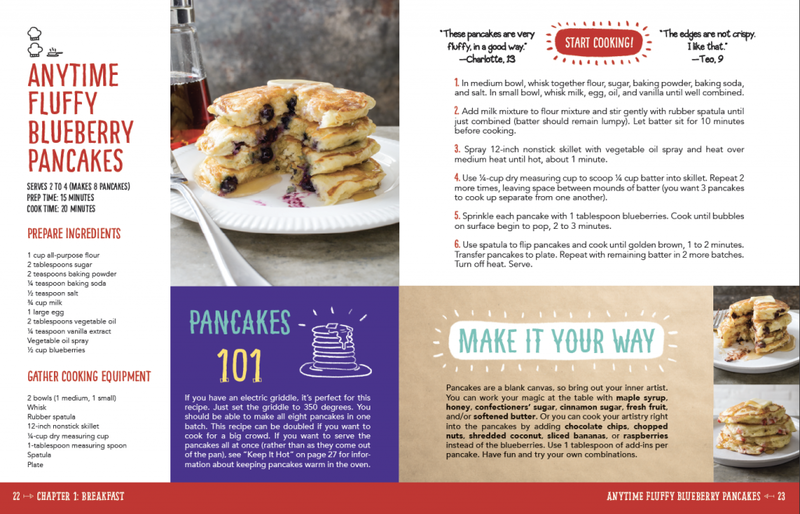 Each Complete Cookbook recipe has a caloric and nutritional breakdown in an easy-reference chart, a no-pressure way for kids to read about choices they can make each day. Also mentioned are the benefits of eating with others, exercising, and understanding that “it’s about good habits—not perfection.” These important messages communicate that we make a difference in our lives, one choice at a time. 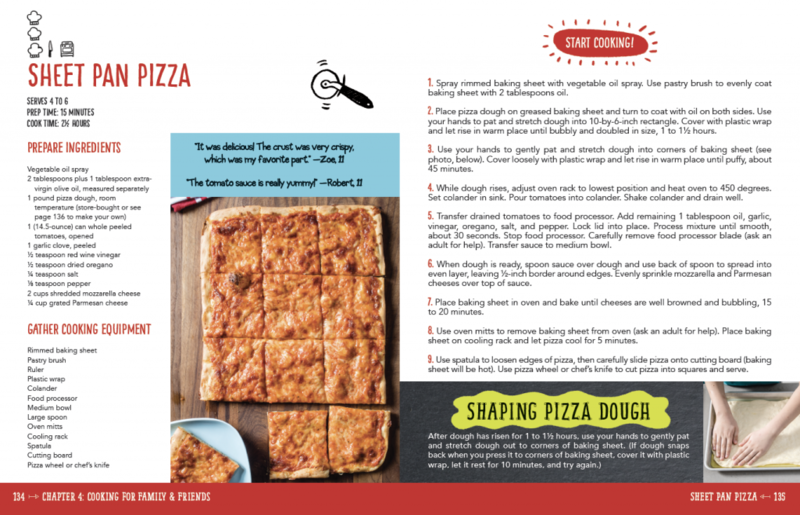 Click here for America’s Test Kitchen kids website. 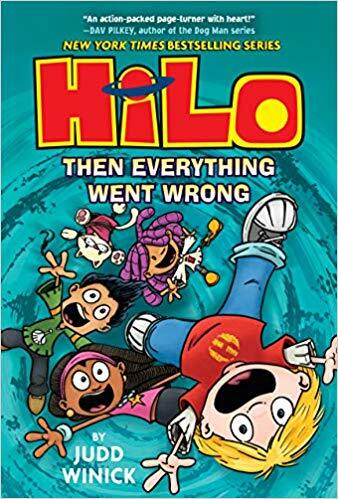 If you’re not already familiar with Judd Winick’s winning Hilo series of middle grade graphic novels, the newest book, Hilo: Then Everything Went Wrong, releases on January 29 and would be a great time to get on board to find out why the books are so popular with tweens. I’m so glad I did. Even though I’ve jumped in with Book 5, that didn’t stop me seeing the appeal and getting hooked. While the books are episodic, the art, the diverse characters and the plot are so good that it doesn’t matter that I came late to the Hilo party so to speak. It’s easy to get up to speed on the relationships and backstory in this action-packed, fast moving and riotously funny robot rooted series. Hilo is a robot who has ended up on Earth along with his sister, Izzy. He’s befriended D.J. (Daniel Jackson Lim) and his family along with Gina Cooper. Those friendships are truly the heart and soul of the series because kids will empathize with them and be enthralled by their adventures. Various other engaging characters include Polly the talking cat, Uncle Trout, teacher Ms. Potter, Dr. Horizon, Razorwark and Dr. Bloodmoon. I can’t even pick a favorite because I liked them all or found them interesting in different ways. Even a couple of the Feds came off likable as you’ll see. The Feds, in fact, want to find Hilo at the same time he and D.J. head off on a risky journey to Hilo’s planet, Jannus, to get answers about his past. Once there, the friends discover that all the robots have mysteriously gone missing and, rather than being a model of a happy, high tech homeland, Jannus has gone backwards with a loss of power. As the boy and robot try to discover what’s happened on Jannus, some crazy stuff is going on back at Vanderbilt Elementary that causes a lot of problems for the kids on Earth and ultimately in space. So many things need to fit into place for Hilo to figure out the puzzle and keep one step ahead. Don’t miss out on this Judd Winick’s rewarding and entertaining series that is ideal for both reluctant readers and anyone “who loves comic books, superheroes, and adventures of all kind.” I honestly loved every colorful minute and am only sorry I missed out on books 1-4! Remember to pre-order your copy today. New York Times bestselling author Neal Shusterman and Jarrod Shusterman’s YA novel Dry follows the perilous adventure of 16-year-old Alyssa in Southern California during a major drought that turns deadly. The drought or “The Tap-Out” has resulted in a cutoff of water from reaching any homes, sending Alyssa’s parents in search of other water sources. Unfortunately, her parents do not return. This turn of events results in an unexpected and dangerous journey for Alyssa, her younger brother, Garrett and their survivalist neighbor Kelton. Companions they meet along the way include rebellious Jacqui and barterer, Henry. 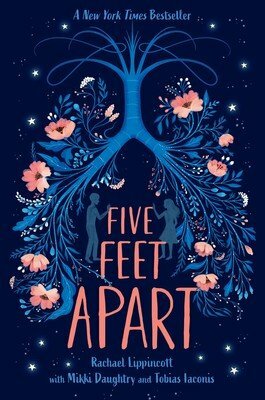 This suspenseful story is told through the eyes of each teen, switching between them and snapshots of outside characters whom the teens encounter in their harrowing journey through California in a desperate search for water. Dry is a fantastic dystopian novel yet its closeness to reality, due to California’s already barren lands, makes the story even more gripping as we could easily be Alyssa or Garrett and so look to see how all the characters deal with crisis. The writing appealed to me because the authors were able to create compelling and distinct individual personalities for the characters, allowing me to identify with certain actions or people within the story. I was fascinated by how the characters reacted in each situation the authors’ depicted because it made me question if I would react in the same way. This novel is guaranteed to keep readers on their toes. 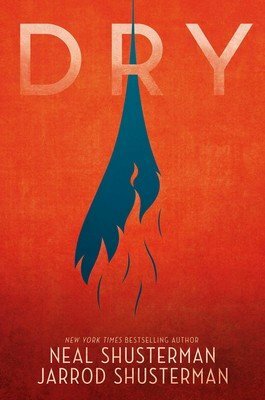 If you’re unsure as to whether to read Dry, I’d say definitely give it the benefit of the drought! 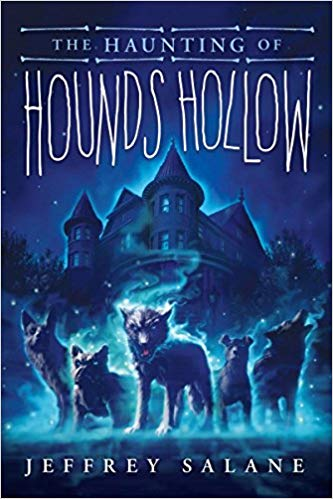 The middle grade novel, The Haunting of Hounds Hollow by Jeffrey Salane, is a recommended read for chilly, dark winter evenings. When Lucas Trainer’s family inherits a house from an almost-forgotten relative they move from the comforting familiarity of the big city to Hounds Hollow. For Lucas, making new friends means explaining his undiagnosed disease (his parents call it the Dark Cloud). Adjusting to being in the middle of nowhere is complicated by their crazy new mansion—akin to the Winchester Mystery House with rooms that lead to nowhere and a construction crew that doesn’t stop building. The town’s history of people disappearing coupled with what may be a roaming pack of malevolent ghost dogs is enough to scare anyone away, but Lucas and his two new friends, Bess and Lens, decide they must uncover what’s going on before it’s too late. Lucas has a mysterious key that he hopes will unlock secrets from the past that continue to have hold of the house and its environs. This book is suited for kids who like plots that delve into horror. The Haunting of Hounds Hollow takes some dark turns, particularly at the end. If you think your kid will grow into a fan of stories like Stephen King’s Pet Sematary then this tale will not disappoint. 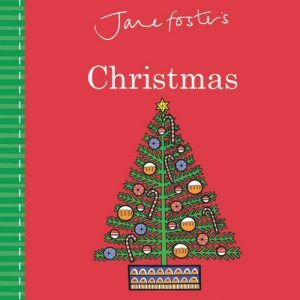 Illustrator and designer Jane Foster helps make spirits bright with her new board book, Jane Foster’s Christmas. This smartly designed and graphically bold concept book will familiarize babies and toddlers with all the signature items we associate with Christmas. From Santa Claus and sleigh, to gingerbread house and hot chocolate, each spread features a word on the left in black typeface and an illustration on the right. Additional subtle graphic elements on the word pages, like polka dots, waves, trees and stripes are visually pleasing too. 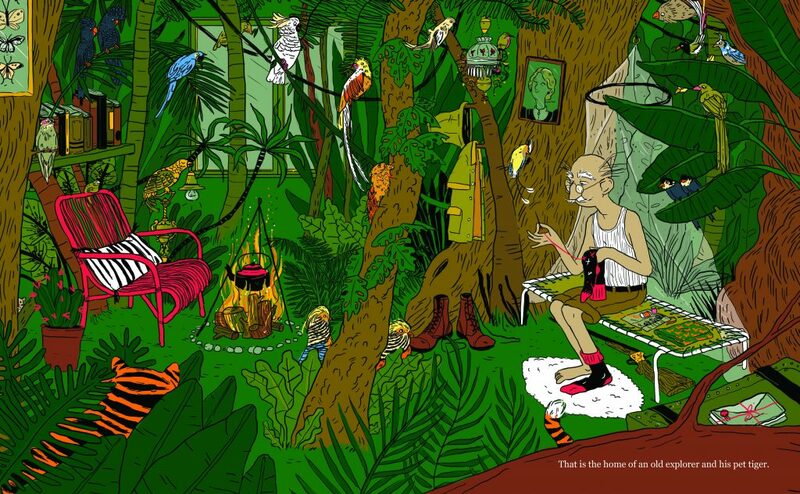 The vibrant colors used add to the book’s appeal as does the shininess of the art and text. This board book is sure to get little ones excited for the holiday with its choice of cheery images presented as beautifully as her 10 previous books in the series such as Things That Go, Animal Sounds and First Words. Need a stocking stuffer? Give this to the youngest readers in your house this holiday season. Here is an oversized, thick and bedazzling board book that needs no wrapping and just begs to be opened like a present. As I turned each page I was treated to a parade of pizzazz, foil and color. The glorious graphics jumped off the page filling me with light and delight. The embossed designs also feel fab to touch so let little fingers wander as they wonder what comes next. The text, spare, but lyrical, promises “joyful smiles” and multiple reads to soak up all the positive energy emanating from between the covers. It’s less a story and more a celebration of the joy that Christmas brings. 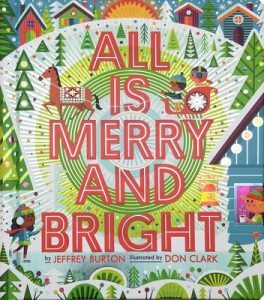 A glowing review for this shiny, happy book that you can feel confident when adding to your Christmas reading list! 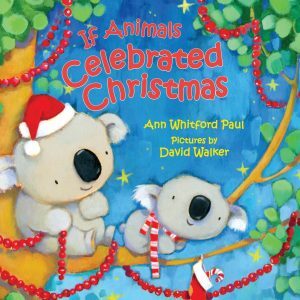 The latest in Ann Whitford Paul’s charming series of rhyming stories, If Animals Celebrated Christmas, ponders what each particular animal would do for the holiday. Koala lovers will be happy these marsupials feature prominently in this tale as do penguins, cranes, buffalo, turtles, owls, oryx, beaver and hedgehogs. Crustaceans also grace the pages. “Crabs would scamper from the deep, dark sea, and build a seashell Christmas tree.” Illustrator Walker’s topped that Christmas tree with a starfish, making it my favorite spread. If you’re curious what the others get up to, be sure to include this book in your holiday shopping. It’s a recommended read-aloud that provides a fun jumping off point for a discussion about what other creatures might do to make the holiday their own. WHERE DO DIGGERS CELEBRATE CHRISTMAS? 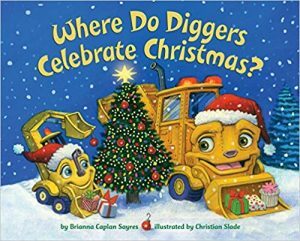 If you’ve got an “all things tractors, diggers and cranes” fan at home, make sure to add Where Do Diggers Celebrate Christmas? to your holiday collection. While in some places the rhyme meter felt slightly off, it didn’t detract from my overall enjoyment of the picture book. In fact I was rather impressed how Sayres came up with such clever ways for vehicles to celebrate. And in case kiddos didn’t know it, diggers, cherry pickers, forklifts, mixers, cranes, tankers, tow trucks, tractors, food trucks and even Zambonis celebrate Christmas by doing the exact same things they do. That means stringing lights, singing Christmas carols and even sharing egg nog with their families. Illustrator Slade’s put a mouse on the pages too, so children can watch out for what the creature gets up to in every spread. Wheels are the way to go in this charming, feel good Christmas story. Who knew that tuba Christmas concerts were a thing? Now that I know about them, having read A Tuba Christmas, I cannot wait to attend one! Unlike my family, the family members in this picture book all play an instrument, and when the story begins, it’s time for the youngest child, Ava, to choose an instrument, too. Everyone is surprised, however, when Ava decides to take up the tuba. She’s helped along by lessons from Rodney, a compassionate high schooler in the marching band. When the tuba’s challenges (it’s clearly rather cumbersome) get to her along with the kids at school (as well as her brothers) teasing her about the tuba, Ava’s ready to call it quits. But Rodney’s not concerned about her progress and invites her to participate in a tuba holiday concert at her school at just the right time. Being part of an ensemble is exactly the kind of supportive and spirited musical environment Ava needs. The audience is enthralled and impressed with the concert including Ava’s performance and she’s over the moon. As Rodney like suspected, rather than giving up on the instrument and her instruction, Ava feels proud of her accomplishment and decides to continue playing. 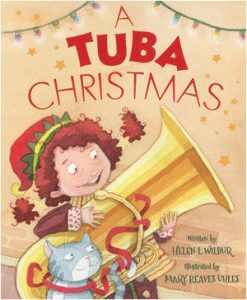 Back matter details the history behind Tuba Christmas concerts and will likely have readers seeking out the nearest one this holiday season. Uhles’s cheerful illustrations pair wonderfully with the exuberance of the tale and perfectly capture Ava’s up and down moments. Wilbur’s written a special kind of Christmas story to share because, in addition to centering around the holiday, it’s also a heartwarming tale about perseverance and how wonderful and motivating it feels when someone (in this case Ava’s instructor) has your back. 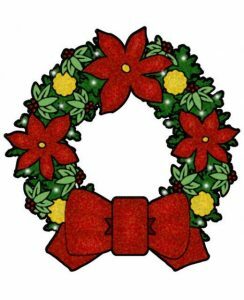 Click here to see Part One of our 2018 Christmas book suggestions. IS BACK AND BETTER THAN EVER! 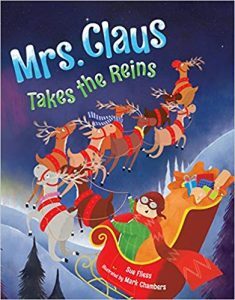 For anyone interested in a holiday book with a strong female character, I recommend Mrs. Claus Takes the Reins written by Sue Fliess and illustrated by Mark Chambers. When Santa wakes up “stuffy” and “sneezy” on the morning of Christmas Eve, Mrs. Claus fearlessly steps in to save the day. She is a proactive problem solver. “‘I may not have magic,’” she says, “‘but I’ve got a brain!’” As she and the reindeer encounter challenges along the way, Mrs. Claus’s resourcefulness helps her stay in control and on task. “[S]tuff[ing] some ribbon to plug up the hole” in the leaky fuel tank, she keeps calm and carries on. In addition to Mrs. Claus’s gumption, I love the endearing and homey touches in the illustrations: Santa’s headboard and footboard with their Christmas tree cutouts, his bedspread with complementary tree designs, his reindeer-patterned socks resting on his footboard, and Mrs. Claus’s updated green plaid skirt. Modern day details also make the story relatable to young readers. Holding a Starbucks look-alike cup in her hand, Mrs. Claus starts off her journey waving goodbye to her elves. Her strong organizational skills can be seen as she maps out “her route” (perhaps using Waze?) on what looks like an iPhone. And on what looks like an iPad, she makes “a supply list and check[s] on the weather.” Even her sleigh has an attachment for her tablet that she uses to check off deliveries! Through rhyme and clever illustrations, children will love to get to know Mrs. Claus’s spunky, can-do spirit. 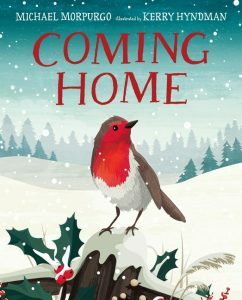 Written by Michael Morpurgo and illustrated by Kerry Hyndman, Coming Home, is a touching tale about a robin’s harrowing journey home to his mate-just in time for Christmas. Before the story begins, readers are given information about the Scandinavian red robin’s migration to find refuge in Britain from the harsher winters up north. In steady rhythm and repetitive language, Morpurgo narrates the robin’s struggles with snow, sleet, predators, fatigue, and fear. “Beat, my wings, beat faster. Easy, my heart, go steady. Steady.” The story’s underlying themes of perseverance and determination are evident in the robin’s journey—a journey, in fact, symbolic of life’s storms and struggles and the ways we can cope with them. We can find community with others who are on a similar path (as the robin does when he joins a flock of thrushes) and seek cycles of rest and rejuvenation. When the unexpected happens, we can also, like the robin, surrender to the mercy of another’s tenderhearted care. If you’re looking for a quiet holiday book that highlights the winter season, I highly recommend this story. Double page, bird’s eye view spreads of a dark and deep blue forest as well as close ups of the bird seeking shelter from the rough winter weather complement each other nicely. A great bedtime story to end the day (and the winter season), Coming Home is a hopeful and soothing tale both adults and children will come home to again and again. 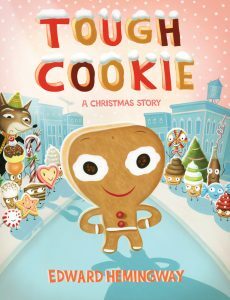 A hilarious fractured fairy tale, Tough Cookie is the story of a cookie with an identity crisis. 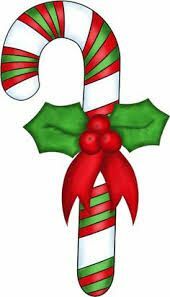 In a town called the “Land of Holiday Treats” where everything is sugary and sweet, our hero feels like the odd cookie out. Written and illustrated by the youngest grandson of Ernest Hemingway, Edward Hemingway brings much fun to the story, especially for younger audiences. Just about everything in his illustrations of Christmastown beams with a happy face. Large text, colorful pastels, and traditional holiday colors create a warm, festive, and inviting atmosphere. Hemingway’s humorous play on words through baking references keeps the pace energetic. Added touches are cookie recipes at the end of the story as well as front and back matter illustrations of adorable cookie characters. I found myself playing a “Where’s Waldo” kind of game by trying to locate each character in the pages of the story (they are there!). I’m certain little ones will find many more creative ways to engage with Cookie’s quest of self-discovery. 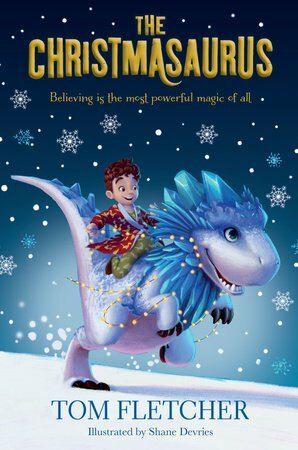 The Christmasaurus, a middle grade novel by singer-songwriter and YouTuber Tom Fletcher, brings us holiday magic in a new way. The Earth’s last dinosaur lives at the North Pole surrounded by a hubbub of activity and some awesome flying reindeer, but, he’s lonely. Around the world, young William Trundle, a dinosaur expert, wants Santa to bring him a dinosaur more than anything. The two are bound to meet, but their adventure isn’t what you’d expect. I like that Tom Fletcher mashes together the struggles kids face at school and at home with our love and fascination for dinosaurs. Add in a bully, an evil villain, and some twists on tradition—and you thought the elves made the presents!—and you’ve got an exciting holiday story. Better still, you will care about William Trundle and the Christmasaurus; the characters have dimension and heart. While I never tire of alphabet books, I do see quite a lot so honestly, the more distinct, the better to catch my eye and then keep me reading. Owls Are Good at Keeping Secrets: An Unusual Alphabet fits that bill to a T. Tt: Toads are terrific at tongue twisters. See what I mean? O’Leary doesn’t waste a minute pulling readers into her adorable, smile inducing descriptions for every animal she’s included. In fact, I bet she had a blast coming up with all their different personality traits and quirks, helping to set this picture book apart from others. Some will catch you off guard: Dd: Dragons cry at happy endings. I love that there are no flames involved, just pure emotion and Pp: Penguins love a big family get-together. Who knew they were such party animals? My fave, the one that gets me laughing out loud, is Rr: Raccoons are always the first to arrive for a party because that sounded just like me. Which letters will resonate with your child? Will it be Ww: Wolves don’t like being told to smile or possibly Yy: Yaks giggle at their own jokes? Find alligators, elephants, meerkats and many more and use the often funny, thought-provoking descriptions to start a conversation about what makes everyone unique. The choice of animals and their clever corresponding stories will entertain even those who feel they’re too old for alphabet books. Grant’s charming artwork in a warm, muted color scheme with ample white space allows the focus to center on the endearing animals and their actions. 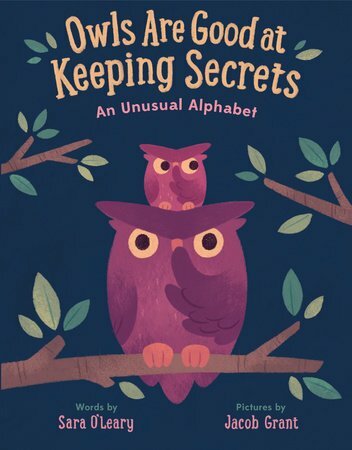 From photograph-taking foxes in the field with a parent waiting in the den below to a hedgehog observing the night sky, there is something for everyone in Owls Are Good at Keeping Secrets, an especially appealing approach to learning the letters A-Z.